When it comes to getting quality paving Ottawa businesses have many places to turn to for assistance. After all, getting the best quality of finish is going to be the difference between paving lasting for months or years. At Brenning Paving and Construction, we pride ourselves on offering a fully certified commercial paving service that concentrates on delivering the results that you need. Ever since our formation, we’ve offered a community-friendly and detailed commercial paving service in Ottawa. We help local businesses and government alike by improving their curb appeal — using the best quality of materials to help deliver a comfortable, solid and level asphalt finish. We offer a wide variety of asphalt services, and are proud to be your one stop shop for commercial paving projects. The benefit having great looking paving and is being left with a beautiful property that you and your patrons can continually enjoy. How Can We Help Satisfy The Demand For Commercial Paving in Ottawa? With so many needs for commercial paving in Ottawa, businesses might not know where to start. We’ll make sure that you do, giving you access to all the information that you could need to take things an extra step further. So, how can we help you get the most complete finish? Brenning Paving and Construction offers a variety of services to make sure you get a truly complete project taking things an extra step further with us. Choosing to work with us is a sure way to improve the aesthetic of your place of business while also ensuring the safe mobility of passers-by and customers! One commercial paving service that we provide is taking on several different roadway projects throughout the city. Working with the City of Ottawa, we make sure to deliver comprehensive and safe roads that you can feel completely confident using. Our commercial paving services are also available to local businesses and private corporations. From a new walkway to make your new-building even more impressive, or restoring an old beat up parking lot, we can make sure you are left with a much more elegant finish. Our team knows exactly how to make sure that your project reflects a lasting refined image. Our team can provide professional asphalt repairs for parking lots or any other commercial/industrial spaces. If your parking is beginning to look a little rough, then investing in parking lot repairs would spruce up the curb appeal of your business! We pride ourselves on delivering a service which is all about capturing the right look and curb-appeal. Because of this, we’ve set about creating a service that isn’t only engaging; it’s easy to work with. 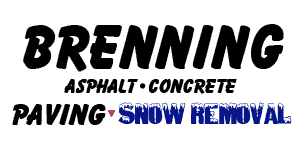 For a commercial paving service in Ottawa that you can trust to get the job done right, choose Brenning Paving and Construction. Making sure that you have a commercial paving plan that actually makes sense for your place of business matters a great deal. During your free estimate, we can come in and take a much closer look at what you are working with, and make sure that you are getting the right style, shape and format of commercial paving. With years of experience and a wealth of skilled tradesmen, we’ve got all the necessary resources and capability to handle any paving job. Contact us today for a smooth path ahead.